Make an impression while expressing yourself beautifully! 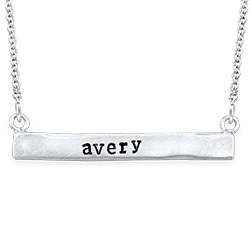 Our Stamped Horizontal Name Bar Necklace in Gold Plating features a hammered hand stamp design made to order. It’s easy to create the perfect gift for mom, grandma, or anyone who deserves a little something – and it’s just right for adding to your own collection, too! Like other gold plated necklaces from our collection, this one is made with sterling silver and glowing 18k gold plate. It is suspended from a 14"-22” rolo chain for the perfect fit. Simply choose up to 11 characters to get started. They can be initials, a name, or even a word that holds a special meaning to you or the wearer. Once it arrives, it’s sure to become a favorite! Love the look and want to see more options? View our entire collection of personalized bar necklaces to celebrate love, family, and friendship.